Seagull (海鸥 = hǎi ōu = seagull) is the brand name used from 1964 by several camera factories situated in the Shanghai region, simply named Shanghai Camera Factory No.1, No. 2, No. 3, ... etc.. In the literature they are collectively referred as Shanghai Camera Factory. Perhaps they are most widely known for their fascinating Shanghai 58 rangefinder camera, based on the Leica IIIa, which evolved with some modifications borrowed from Canon and FED, and more recently the Seagull DF cameras, a manual focus 35mm SLR range. The first ones were simply copies of Minolta SR models since they were the easiest to copy. Later the cameras were produced with licence from Minolta. Some SR mount lenses of Seagull's own brand Haiou were made too. The Seagull-4 series of TLR cameras, introduced in 1964 and distributed worldwide, is a continuation of the earlier Shanghai TLR; itself quite possibly produced using outdated Japanese tools and manufacturing equipment. These cameras are usually found with knob wind, but the Seagull 4A has lever wind. 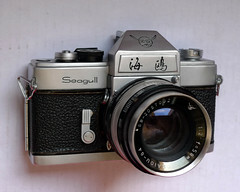 There are also a range of Seagull 35mm rangefinder models, as well as a range of Seagull folding roll film cameras typical of the immediate post war European production. Several Seagull camera accessories are known, for example the electronic flashgun SG-100 and several accessory angle finders for SLRs. In 1976 three of the Shanghai camera factories moved together into the new factory Shanghai General Camera Factory in Song Jiang County. The 35mm SLR series Seagull DF-... was continued there. The Seagull CL-A light meter was made in the Shanghai No. 2 Photographic Equipment Factory. 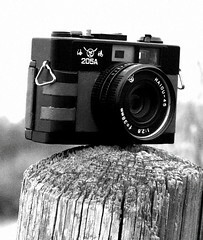 In 1999 600.000 units (cameras and lenses) could be produced per year. 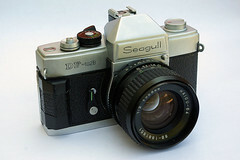 In 2001 Seagull planned to produce digital cameras for Kodak. A most thorough research on the Chinese camera production was carried out by resident Douglas St Denny. He travelled across the vast country during the second half of the 1980s interviewing people there and collecting information which otherwise soon would have been lost. His book "Cameras of the People’s Republic of China" is invaluable for anyone studying this topic. 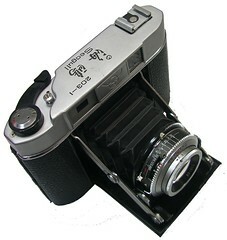 Seagull 4 - A copy of the Shanghai TLR, originally called the 58-III. Seagull 4A - Improved on the Seagull 4 by offering a crank type film advance. Seagull 4B - An inexpensive version of the Seagull 4A, using a ruby window in place of an automatic film advance. Seagull 4B-1 - Like the Seagull 4B except for inclusion of a Fresnel screen making it easier to focus. Seagull 4C - Like the Seagull 4B except for a modification to optionally use 135 film. 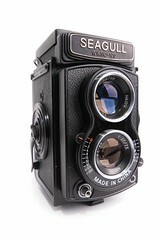 The 35mm camera bodies of Seagull were made with Minolta's SR-lens-bayonet. In addition to the cameras listed below Seagull produced similar products for other camera companies. Beware that the digital Seagull D55 presented in this page is an April fools joke. Seagull/Shangai page at Collection G. Even's site. This page was last edited on 10 March 2019, at 12:20.